It might feel a little early in the election cycle to be looking this far down the road, but the electoral college is going to be a hot topic of conversation in coming months, and now's the perfect time to get a refresher course. It's a perplexing and frequently misunderstood concept in American government, and it doesn't lend itself well to study. It's been slightly shrouded in mystery for years, and most of the partial explanations in the media don't give the full extent of the surprisingly undemocratic system. 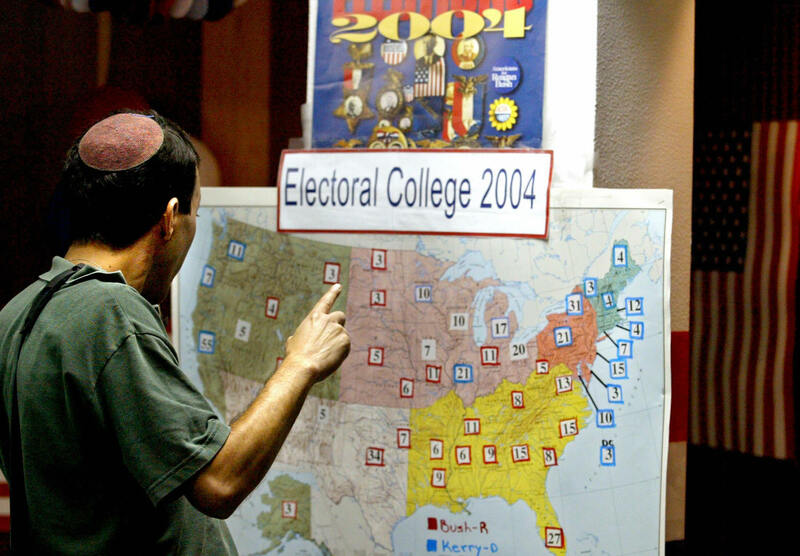 So how exactly does the electoral college work? The process begins with the electors — 538 of them, to be precise. The number isn't randomly chosen — it's equivalent to all 100 senators, 435 representatives, and three electors from the District of Columbia. So theoretically, everyone in the country is equally represented. Electors are chosen at state party conventions, and are usually state party members or political allies of presidential candidates. So each candidate picks a slate of electors in every state, and then on Election Day, voters choose both the candidate and his or her group of electors. Following the popular vote in the November general election, the electors meet in their respective states to cast their votes. The certificates of vote are sent to the Office of the Federal Registrar, who authenticates the certificates, then sends them to Congress to be formally counted and announced. Whichever candidate reaches 270 votes wins the presidency. That process is complicated enough, but then you have to factor in all the potential for things to go wrong. Twenty-six states have laws requiring electors to vote with their party's nominee. However, 24 states have no law requiring the electors to stick to the popular vote. For example, Texas has 38 electoral votes and hasn't picked a Democrat in the popular vote since 1976. But if the Texas electors wanted to stage a coup and all vote for the Democratic candidate, then it's totally their prerogative. In 24 states, electors can completely ignore the will of the people and vote for whomever they want. It's almost never happened in the history of the United States, but it's possible, and that's enough cause for concern. Furthermore, in 48 states, the winner of the popular vote takes all the electoral votes for that state (which is why winning swing states with large populations, like Florida and Ohio, is so important). But in Nebraska and Maine, the winner of the popular vote gets the two electoral votes that represent the senators, and the other votes are dispersed among who won the vote in each congressional district. Technically, those voters have more sway in the election, because their votes get lumped into a smaller demographic — which doesn't seem fair to the people in nearly every other state, whose votes count for less. There seem to be a few moral quandaries inherent in the electoral college system as well. Casting votes individually can't cause divisiveness, not least because it's a secret ballot and no one is obligated to reveal their vote. But assigning electors on the state level promotes a state identity as being part of one party or the other. This is part of the reason states that used to swing from election to election, like California, are becoming increasingly partisan. The electoral college system also discriminates against American citizens who don't live in states. More than four million Americans live in territories like American Samoa, Guam, Puerto Rico, the Northern Mariana Islands, and the U.S. Virgin Islands, but they do not have the right to vote in presidential elections. There are other bureaucratic obstacles blocking these citizens' right to vote, but one major rationalization behind their disenfranchisement is the fact that the territories are not technically states in the union, and our electoral process is so dependent on state-level activity. So not only is the system relatively undemocratic for those who are even allowed to participate, it's entirely exclusive to a significant portion of American citizens. There a couple of morals to this story. First, although it may seem antithetical, voting is super important — just probably not in the way you thought. Ensuring state-level wins in the popular vote is the best way to get your preferred candidate into the White House, which means canvassing for your candidate and voting in your election. You can't get away with the "It's just one person; my vote doesn't matter" excuse anymore — even if you live in a highly populated state, your vote will count for more among 30 million than among 300 million. Second, the electoral college may be antiquated and unnecessary, but it's almost certainly here to stay, and everyone needs to pay attention to how it works. Get involved in state politics if you can and become part of the process yourself, because it's the best way to effect change. And finally, if you feel bad about not remembering any of this from your high school government class, just know that I had to look it all up, too.